you could also get your free download at our ge.tt page, here. 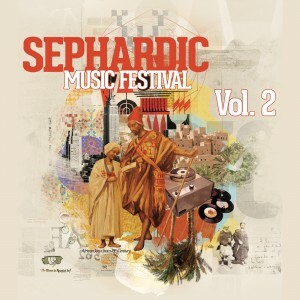 * The Sephardic Music Festival’s second compilation album ranges from traditional Sephardic folk songs to hip hop, electro, and dance music. Cheb i Sabbah, among the most talented world-music producers, kicks off the compilation with “Im Ninalou” (If the Doors are Locked), a traditional Yemenite song made famous by the late great Ofra Chaza. Israeli club kids Axum blow up the compilation with their energetic “Knowa.” Dunkelbunt remixes Marseille-based Watcha Clan, which mixes Balkan brass and Sephardic folk with Gnawa trance and hip-hop. DeLeon uses their distinctive style of rock to transform ancient Sephardic folk music into a sound that is both brand new and centuries old. On Ansi Dize La Novia, DeLeon borrows Manu Chao-esque grooves to convey an ancient tale of a bride being described to a groom. Each of her features is more beautiful than the last just as each of this song’s verses is funkier than that which preceded it. Jerusalem native Mor Karbasi chills out the compilation with her beautiful song titled “Arvoles.” The listener can’t help but feel that they are floating along on a carpet as Karbasi sings gently to the accompanying piano. Tel Aviv’s Cohen@Mushon highlights the 90’s golden era hip hop sound. Diwon includes a couple of his own tracks including a Middle Eastern instrumental single and a “Maoz Tzur” holiday-inspired song with an LMFAO feel. The latter track features ex-Hasidic, gay rapper Y-Love and Ladino songstress Sarah Aroeste. Like the Sephardic Music Festival itself, the compilation album highlights the remarkable diversity that exists within the Jewish community. While other Jewish music festivals focus mostly on Ashkenazi tunes, themes, and beats, the Sephardic Music Festival offers a fascinating exploration of Sephardic music and culture from around the world. CHECK OUT THE JEWISH JOURNAL, HERE. CHECK OUT THE FESTIVAL SCHEDULE, HERE.